I love tattoos and am obsessed with the artistry of them. I’m by no means covered — I have seven, only two of which are highly visible — but I have always been very passionate about the process of getting tattooed. I don’t have any plans to stop, although I tend to take my time with the designing and planning process — I could easy drop a grand on the sleeve I’ve been envisioning for the last two years and live like a pauper for a couple months to make up for it, but that’s not my style. 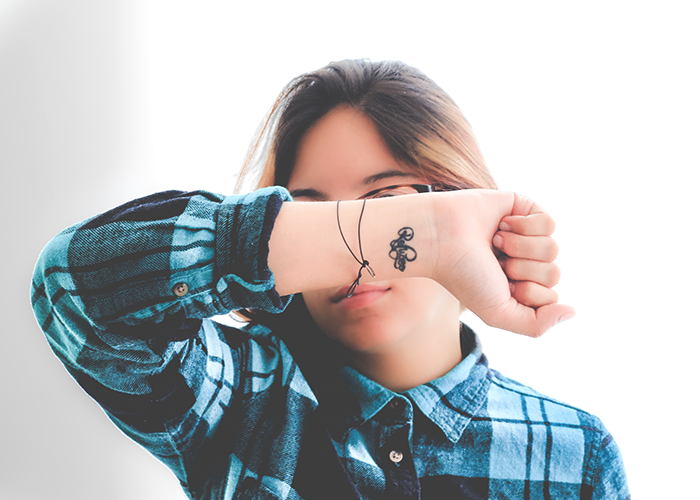 With that in mind, I wanted to create a guide for tattoo newbies on TFD, because I have always found the cost of tattoos to feel very elusive to people who don’t have them. Convincing someone that a $180 tattoo is only a drop in the bucket when you don’t eat out, barely drink alcohol, and live with your parents isn’t easy — so I stopped trying to do it. I do believe that tattoos should be saved up for, even if they’re small. But with just a little bit of planning, tattoos can be a perfectly manageable expense, and a great new adventure to treat yourself to. In total, over the past nine years, I have spent just over $1,300 CAD ($1,069.90 USD) on seven tattoos of varying sizes and styles. This does not include tax or tip (a note on that below). My expenses are based on a total of about 14.3 hours of work (I don’t have any massive, eight-hour pieces; my longest sitting was about four hours, which factored in a few breaks). How artists charge, and what to expect. In my experience, most artists charge based on time estimated and charge per hour (with new clients), and many charge a minimum of one hour. One exception was my first artist, who charged based on the estimated time in minutes, and charged at a rate of $2 per minute (resulting in a total of $180, or $148.14 USD). Personally, I feel like the average rate from my total expenses/hours sat ($90/$74.07 USD per hour) is not realistic for new tattoos. For example, I have gone to the same artist for the last five pieces, and as we’ve become more comfortable with each other, the total has usually been determined following the completion of the work, and not on a set hourly rate. It is safe to assume a base of $100/$82.30 USD per hour, although this may be higher or lower depending on location. My current artist always gives me my total before tax, whereas others have factored tax into the total. Some also request deposits of about $50 upon consultation. When I lived near campus, a small tattoo shop opened up that would frequently target students with tempting walk-in deals — things like $60 shamrock tattoos for St. Patrick’s Day. I’ve never gotten a tattoo on a walk-in before, and while I’m not anti-walk-in at all, I would never recommend a walk-in for a tattoo newbie. Consultations are key when you’re new to the world of tattoos to understand how rates are determined, and they give you a chance to get to see the inside of the shop, meet the artists, and go through their books. Some artists factor gratuity into the price of their work; others don’t. This is one of the things you should cover in your consultation — ask them what people usually tip, and how much time they’re setting aside for you. If you can’t afford to add a tip onto the work, you probably shouldn’t be getting a tattoo. I have seen several specialized “tattoo balms” for aftercare, most of which are just generic salves in different packages. I don’t believe anyone needs these — any scent-free salve is great for day-to-day moisture and shine (plus SPF for exposed tattoos). You also should avoid painkillers before a tattoo. Yes, tattoos are a painful process (even if some manage it better than others). However, because they result in a moderate amount of bleeding, you should not take any type of painkiller (or ingest any alcohol) that will risk thinning your blood. Aside from a fragrance-free salve , you should have scent-free soap with gentle ingredients on hand. Wear clothes that you’re okay getting a bit of blood on, depending on the placement, and make sure any clothing you’re wearing for the next few days is loose. Have a friend with you to take care of transportation afterward just in case you’re woozy — some people get a little dizzy from the adrenaline. Always ask about these. Two of the three artists I’ve gone to offer complimentary touch-ups on their own work, and I won’t go to an artist that won’t offer free touch-ups (note for newbies: a touch-up is different than a cover-up). You shouldn’t have to pay extra for someone’s unsatisfactory work (and it’s worth adding that artists don’t want their work to look sub-par, which is why many will offer touch-ups for free). Of course, one of the biggest fears of people without tattoos is that they will someday regret their choices, rendering the tattoo a big, permanent, unsightly waste of money. I will admit what others might be afraid to: I do have some regrets with my tattoos, but nothing I lose sleep over. Every day I have second thoughts about the placement of some, the color choice on others. My first tattoo in particular no longer aligns with my aesthetic tastes and, as my body has changed, doesn’t quite look as sharp. I may cover it up, or I may not. However, this doesn’t mean that I see it as $180 pissed down the drain, nor do I use it as a cautionary tale to the curious. For me, it serves as a reminder that the choices you make indeed leave an impression, and you live with them. You could beat yourself up over it, throw more money over it, or just accept that it happens to more people than you think. It doesn’t mean you should be careless by default — sensibility always has a place — but it does mean that your mistakes are often just skin-deep. Bree Rody-Mantha is a business journalist and dance teacher living in Toronto. In her spare time, she enjoys sport climbing, lifting and running the vegan food blog, Urban Garlic. Follow her on Twitter here.